Description: Arduino® has now been replaced with Micropython running on the ESP32 for shade and blind motors, skylights, window openers, LED lighting, etc. Our NodeSwitch™ radio RF control system is designed for residential and commercial applications. Use our boards, make your own, or plug in Nano expansion modules from Gravitech to automate blinds, shades, motors, window and skylight openers, lighting or anything else you need to control. Use your web enabled phone, tablet or PC to control your home while you are home or away. Description: We have special battery powered motors with built-in batteries, but all our motors run on 12 volts DC and can be backed up by battery operation if the AC system fails, using one of our battery packs with an AC charger. Solar panel systems can also be used as a power source, provided the system has enough output power capacity. Description: A latching relay can used (when triggered by an impulse) as a power switch to operate a circuit. Our solid state (ssr) version of a single pole relay is toggled on/off by a 12 volt momentary pulse. A momentary contact activates it, and it stays latched until it receives another 12v pulse. Description: AC tubular motors with radio control used for roller blinds, home theater projector screens, and industrial designs. Also compatible with our Arduino powered LED lighting controllers. Description: Reversing polarity of DC shade motors can be accomplished with a simple DPDT (double pole, double throw) switch. This wiring diagram shows how to configure a DPDT switch as an H Bridge configuration for reversible blind and shade tubular DC motors. Motors can be reversed whether powered by battery or power supply. Description: All our motors run on 12 volts DC and can be inserted into standard tubing available at any metal supplier or welding shop. Aluminum is the preferred tube material, but you can also use steel (EMT conduit, for example), stainless steel, carboard or plastic. Description: DIY blind & shade motors use a multi-channel RF remote control, not infrared. RF is not directional and will pass through walls. Description: DIY tubular blind motors are inserted into aluminum tubing to created a motorized blind or shade roller. The information on this page is designed to help you choose the right tubing to use with our Rollertrol™ motors. Tubular motors used for window blinds and shades, mini blinds, skylights and home theater projector screens can be controlled individually in a group by a single remote. Description: DIY remote control of blind motors and room lights with a multi-channel RF remote control is not directional and will pass through walls. Description: DIY remote control of blind motors with more than one multi-channel RF remote control. Each motorized window blind or shade can be controlled individually by channel or all at once in a group. Description: DIY blind & shade motors use a multi-channel remote control. Each shade is assigned to its own channel on a single remote control unit. Description: DIY drapery motor kit uses battery operated wireless motor with a multi-channel RF remote control that can also be used for motorized blinds, shades and other devices. Description: You can make a remote control projector screen for home theater out of an ordinary roller blind from Ikea® or Home Depot®. Read about this customer's experience converting a Tupplur window blind from Ikea® into a remote control projection screen. Description: DIY blind & shade motors use electronic pulse counters to determine travel limits very accurately. Unlike older mechanical travel limit switches, these motors are capable of unlimited turns between limits and are thus suitable for very high windows such as those found in greenhouses, atriums and entry portals. Description: Motors for home theater use can be purchased on our website; you can make a remote control projector screen for home theater out of an ordinary roller blind from Ikea® or Home Depot®. Read about this extreme home theater setup. Description: DIY blind motors FAQ that run on 12 volts DC are our main product. Every day we get many inquiries; this is an FAQ link list of the most often asked questions and answers relating to topics about our DC tubular motors. Description: IFTTT example program: our skylight motors and window openers can be configured to close with our rain sensor. Our wifi hub phone app can be used for smart film, projector screens, blackout blind motors, drapes and curtains, lighting, audio, HDMI switching, etc. Description: IFTTT example program: motorized skylight and window openers can be triggered to close with our rain sensing system. Our wifi hub phone app can also be used with RF and IR remotes for blackout blind motors, projector screens, smart film, motorized drapes, lighting, audio systems, HDMI switching, etc. Description: The very bright anchor LED lamp only consumes 2.4 watts (200 mA). The marine grade day/night anchor light sensor photocell switch has an extremely low standby draw of 0.00015 A and a high power handling capability (200 watts) that can be used to power other devices. Description: Our wifi RF-IR blaster for motorized blinds and shades can also be used to control window openers, drapes, TV, projector screens, lighting, skylight openers, and many other devices. The Android or IOS phone app can learn RF motor control signals as well as IR codes. Description: For RV, motorhome and trailer owners we have special aftermarket motors that are often well suited as replacement motors for factory installed blinds and shades. If you are finding that manufacturers will not supply just a replacement motor, please check out our replacement motors. These can also be used to retrofit manual shades, blinds and flagpoles. Description: Blinds, shades, drapes, curtains, window and skylight openers can be motorized with our retrofit motors inserted into roller tubing. We sell all across Canada, including Saskatchewan: Regina, Saskatoon, Estevan, Moose Jaw, North Battleford, Prince Albert, Swift Current, Weyburn, Yorkton, etc. With our dual shade system, you could switch between translucent UV protection and blackout blinds. Description: DC tubular motors used for roller blinds and home theater projector screens. Arduino compatible DC tubular motors used for roller blinds and home theater projector screens. With battery backup, and solar power, Rollertrol motors can be controlled individually in a group by a single remote. Description: DIY: how to set up a motorized battery operated remote control window opener (actuator) for ventilation control, window or skylight opening, shutters - use RollerTrol™ 12v DC linear actuator with our remote control systems. Description: DIY: how to set up a motorized battery operated remote control window opener (actuator) for ventilation control, window or skylight opening, shutters - use RollerTrol™ 12v DC linear actuator with our remote control systems. These units are ADA compliant. Description: Adjustable light sensors can be used to operate LED lighting and other DC circuit components. This article provides instructions for our 5v to 18v DC adjustable light sensing switch (SPLS-12-30W). Description: Make money with our affilate program by referring people to our automation products that control blinds, window openers, drapes, TV, projector screens, lighting, skylight openers, and many other devices. Description: Alexa can control motorized blinds and shades with the Amazon Echo Show, Dot or Tap. It can also be used to control TV, projector screens, window openers, drapes, lighting, skylight openers, and many other devices. There are a number of different ways to do this. Description: LED lighting and motor control are two major features of our Arduino compatible RollerNode™ system. This is an introduction to the features and conceptual design behind the LED dimming capabilities (great for cove and valance lighting) and the DC motor reversing option for devices such as our window openers. Description: LED lighting and motor control are two major features of our Arduino compatible RollerNode™ system. These basic instructions show how you can set up LED dimming (great for cove and valance lighting) and the DC motor reversing option for devices such as our window openers. Description: LED lighting, roller blind, window, skylight and drapery motor control are functions provided by our Arduino compatible RollerNode™ system. This article is provided as a guide for installing and programming the Arduino microprocessor for different functionality. For instance, you may want the LED control to be a simple on/off function, or you may want to alter the LED dimming behavior, such as a slower or faster soft start dim rate. Description: Skylight shades, drapes, LED lighting, roller blinds, window openers and other motorized devices can be controlled by our Arduino compatible RollerNode™ system. This article is provided as a guide for installing and programming the Arduino microprocessor for different functionality, such as altering the LED dimming behavior by changing the soft start dim rate, or make it operate as a simple on/off switch. Description: Arduino compatibility is a major feature of our programmable RollerNode™ system; blinds, shades and LED lighting can be operated by phones, tablets, or PC with your wifi router or over the Internet. The DC motor reversing option allows remote radio control of devices such as our window openers. Use our RollerNode LED light controller to adjust room lighting (great for cove lighting) with the same multi-channel remote that controls our radio motors for blinds. Description: Arduino and Vera compatibility is a major feature of our programmable RollerNode™ system; blinds, shades and LED lighting can be operated by phones, tablets, or PC with your wifi router and Vera (and over the Internet). The DC motor reversing option allows remote radio control of devices such as our window openers. Use our RollerNode LED light controller to adjust room lighting with the same multi-channel remote that controls our radio motors for blinds. Description: Automating blinds,shades, window openers does not have to be difficult. We have designed our system with 3 levels of automation that will preserve your initial investment, using protocols such as bluetooth and zwave. Description: Battery operation of blind motors explained: all our motors run on 12 volts DC and can be backed up by battery powered operation if the AC system fails, using a battery pack with an AC charger. Solar panel systems can also be used as a charging source, provided the system has enough output power capacity. Description: Our motorized wireless battery operated remote control window opener (actuator) is very easy to install, and can also be used for vents, shutters and any other device that requires a small activating force. Description: Best home automation system compatibility guide explains how to connect our blind and motorized shade systems to the most popular home automation systems. Shade and blind motors (DIY) are our specialty: 12v DC electric tubular motors are used for remote control of window treatment blinds and shades, window openers, skylight openers and other devices. Description: Blackout blinds and night shades with side channels can be motorized with our tubular motors inserted into some roller tubing. You can also replace the roller tubing with a larger size. Blackout blinds and night shades can also be installed with a dual roller system so that you can select different shade material. For example, you could switch between blackout material and translucent shades, depending on light conditions and time of day. Description: Blind motors can be controlled by Alexa, using the Raspberry Pi (RPi), Node-RED and the BroadLink controller hub as a home automation system. The Raspberry Pi can be used as a low cost, user-friendly home automation and greenhouse controller when coupled with open source control software like the amazing Node-RED visual design program for IoT. Description: Blind motors and electric window openers can be controlled by the Raspberry Pi (RPi), Node-RED, Alexa and the BroadLink controller hub as a home automation system. The amazing Node-RED visual design program for IoT has library components that support the BroadLink hub and other devices in the BroadLink family. Description: Alexa can control shade motors and window openers with the Raspberry Pi (RPi), Node-RED, and the BroadLink RF-IR controller hub. The Node-RED visual design program for home automation has library components that support the BroadLink hub and many other devices. Description: Alexa can control lighting as well as blind motors and window openers with the Raspberry Pi (RPi), Node-RED, and the BroadLink RF-IR controller hub. The Node-RED visual design program for home automation has library components that support the BroadLink hub and many other devices, such as x10 lights. Description: Alexa can control blind motors and window openers with the Raspberry Pi (RPi), Node-RED, and the BroadLink RF-IR controller hub. The Node-RED visual design program has library components that support the BroadLink hub. Description: Alexa controls lights, blind motors, window openers and many other devices with the Raspberry Pi (RPi), Node-RED, and the BroadLink RF-IR controller hub. The Node-RED visual design program has a dashboard that you can access with any wifi enabled device. Description: Alexa controls blind and shade motors, window openers and many other devices with the BroadLink RF-IR controller hub and Node-RED running on the Raspberry Pi (RPi). The Node-RED automation program has a dashboard system that you can custom design and view with any wifi enabled device. Description: How to calculate loads (blind fabric or screen material weight) for RollerTrol™ 12v DC tubular motors. Typical applications are blinds and shades, mini blinds, and home theater projector screens. With battery backup, and solar power, Rollertrol™ motors can be controlled individually in a group by a single remote. Description: Make motorized blinds and shades work with any home automation system such as x10®, Z-Wave®, Zigbee®, Insteon®, Crestron® and Control4®. Our RollerTrol™ motor control interface for our tubular motors uses safe low voltage DC to raise and lower your blinds controlled by your home automation system. Description: Our phone app for motorized blinds and shades uses a wifi hub that can also be used to control TV, projector screens, skylight openers, window openers, drapes, lighting, etc. The app communicates via WiFi, and it can learn RF motor control protocols as well as IR codes. Description: The BroadLink phone app for motorized blinds and shades uses a wifi hub that can also be used to control RF remotes for blind motors, projector screens, skylight openers, window openers, motorized drapes, lighting, etc. The app communicates via WiFi, and it can learn x10 radio protocols as well as IR codes. Description: Our Christmas Special wifi phone app for motorized blinds and shades can also be used to control TV, projector screens, window openers, drapes, lighting, skylight openers, and many other devices. The app communicates via WiFi, and it can learn RF motor control signals as well as IR codes. Description: Motorized blinds and shades can be controlled with our BroadLink wifi hub that can also be used to control RF remotes for projector screens, smart film, skylight openers, window openers, motorized drapes, lighting, etc. The app can also learn IR codes as well as x10 radio protocols. Description: Our phone app RF-IR blaster for motorized blinds and shades can also be used to control TV, projector screens, window openers, drapes, lighting, skylight openers, and many other devices. The app communicates via WiFi, and it can learn RF motor control signals as well as IR codes. Description: Our motorized window blind and shade motors can be operated by a timer. This series of articles provides a step by step guide to programming the radio remote control timer used with our G series shade motors. The timer can also be used as a stand-alone wall switch; regular timer operation can be bypassed with manual or random operation of the blinds. The timer is battery operated and requires no wiring; you can mount it on any convenient wall. Description: Shade and blind motors can be operated by a timer. This series of articles provides a guide to programming the remote control timer used with our G series blind motors. The timer can also be used as a stand-alone wall switch; it is battery operated and requires no wiring. You can mount it on any convenient wall and the controls signals will reach anywhere in a typical home. Description: Timers can be used to operate our motorized window blinds and shades. This series of articles provides a step by step guide to programming the radio remote control timer used with our tubular motors. The timer can also be used as a stand-alone wall switch, and preset timer operation can be bypassed with manual operation of the up/down/stop buttons. The timer is battery operated and requires no wiring; you can mount it on a wall in any convenient location. Description: Our motorized window blinds and shades can be operated by our timers. This series of articles is a guide for setting up the radio remote control timer used with our shade and blind motors. The timer can also be used as a stand-alone wall switch, the timer operation can be bypassed with manual operation of the up/down/stop buttons. The timer is battery operated and requires no wiring; you can mount it on a wall in any convenient location. Description: Blinds and shades can be easily motorized with remote control using our retrofit motors inserted into roller tubing. We sell all across the USA, including Vermont: Burlington, Montpelier, Brattleboro, Stowe, South Burlington, Bennington, Rutland City, Williston, Essex Junction, Middlebury, Waterbury, Colchester, Manchester, Woodstock, St. Johnsbury, Shelburne, Killington, Barre City, Winooski, Essex, Rutland, Vergennes, Bellows Falls, Newport, St. Albans, Springfield, Norwich, Castleton, Windsor, Putney, Marlboro etc. With our motorized dual shade system, you can switch between translucent UV protection and blackout blinds. Description: Blinds and shades can be easily motorized with remote control using our retrofit motors inserted into roller tubing. We sell all across the USA, including Alabama: Birmingham, Montgomery, Mobile, Huntsville, Tuscaloosa, Hoover, Dothan, Decatur, Auburn, Vestavia Hills, Madison, Gadsden, Florence, Bessemer, Phenix City. Description: Blinds and shades can be easily motorized with remote control using our retrofit motors inserted into roller tubing. We sell all across the USA, including Connecticut: Bridgeport, New Haven, Hartford, Stamford, Waterbury, Norwalk, Danbury, New Britain, West Hartford, Greenwich, Bristol, Hamden, Meriden, Fairfield, West Haven. Description: Blinds and shades can be easily motorized with remote control using our retrofit motors inserted into roller tubing. We sell all across the USA, including Illinois: Chicago, Aurora, Rockford, Naperville, Joliet, Springfield, Peoria, Elgin, Waukegan, Cicero, Decatur, Champaign, Evanston, Arlington Heights, Schaumburg, etc. With our motorized dual shade system, you can switch between translucent UV protection and blackout blinds. Description: Blinds and shades can be easily motorized with remote control using our retrofit motors inserted into roller tubing. We sell all across the USA, including Indiana: Indianapolis, Fort Wayne, Evansville, South Bend, Gary, Carmel, Hammond, Bloomington, Muncie, Lafayette, Anderson, Terre Haute, Fishers, Elkhart, Mishawaka. Description: Blinds and shades can be easily motorized with remote control using our retrofit motors inserted into roller tubing. We sell all across the USA, including Kentucky: Lexington-Fayette, Louisville, Owensboro, Bowling Green, Covington, Richmond, Hopkinsville, Henderson, Frankfort, Jeffersontown, Florence, Paducah, Nicholasville, Elizabethtown, Valley Station. Description: Blinds and shades can be easily motorized with remote control using our retrofit motors inserted into roller tubing. We sell all across the USA, including Louisiana: New Orleans, Baton Rouge, Shreveport, Metairie, Lafayette, Lake Charles, Kenner, Bossier City, Monroe, Alexandria, Marrero, New Iberia, Houma, Chalmette, Laplace. Description: Blinds and shades can be easily motorized with remote control using our retrofit motors inserted into roller tubing. We sell all across the USA, including Maryland: Baltimore, Columbia, Silver Spring, Ellicott City, Germantown, Dundalk, Rockville, Gaithersburg, Frederick, Bowie, Towson, Aspen Hill, Bethesda, Potomac, North Bethesda. Description: Blinds and shades can be easily motorized with remote control using our retrofit motors inserted into roller tubing. We sell all across the USA, including Michigan: Detroit, Grand Rapids, Warren, Sterling Heights, Lansing, Flint, Ann Arbor, Livonia, Dearborn, Canton, Westland, Troy, Farmington Hills, Southfield, Waterford, etc. With our motorized dual shade system, you can switch between translucent UV protection and blackout blinds. Description: Blinds and shades can be easily motorized with remote control using our retrofit motors inserted into roller tubing. We sell all across the USA, including Missouri: Kansas City, Saint Louis, Springfield, Independence, Columbia, Saint Joseph, Saint Charles, Saint Peters, Florissant, Blue Springs, Chesterfield, Joplin, University City, Oakville, Cape Girardeau. Description: Blinds and shades can be easily motorized with remote control using our retrofit motors inserted into roller tubing. We sell all across the USA, including North Carolina: Charlotte, Raleigh, Greensboro, Durham, Winston-Salem, Fayetteville, Cary, High Point, Wilmington, Concord, Greenville, Asheville, Jacksonville, Gastonia, Rocky Mount, etc. With our motorized dual shade system, you can switch between translucent UV protection and blackout blinds. Description: Blinds and shades can be easily motorized with remote control using our retrofit motors inserted into roller tubing. We sell all across the USA, including Ohio: Columbus, Cleveland, Toledo, Cincinnati, Akron, Dayton, Parma, Canton, Youngstown, Lorain, Springfield, Hamilton, Kettering, Elyria, Middletown, etc. With our motorized dual shade system, you can switch between translucent UV protection and blackout blinds. Description: Blinds and shades can be easily motorized with remote control using our retrofit motors inserted into roller tubing. We sell all across the USA, including Oklahoma: Oklahoma City, Tulsa, Norman, Lawton, Broken Arrow, Edmond, Midwest City, Moore, Enid, Stillwater, Muskogee, Bartlesville, Shawnee, Ponca City, Ardmore. Description: Blinds and shades can be easily motorized with remote control using our retrofit motors inserted into roller tubing. We sell all across the USA, including Pennsylvania: Philadelphia, Pittsburgh, Allentown, Erie, Reading, Bethlehem, Scranton, Lancaster, Levittown, Harrisburg, Altoona, State College, Wilkes-Barre, York, Chester, etc. With our motorized dual shade system, you can switch between translucent UV protection and blackout blinds. Description: Blinds and shades can be easily motorized with remote control using our retrofit motors inserted into roller tubing. We sell all across the USA, including Puerto Rico: San Juan, Carolina, Ponce, Caguas, Guaynabo, Mayaguez, Trujillo Alto, Arecibo, Rio Grande, Fajardo, Levittown, Vega Baja, Catano, Guayama, Humacao. Description: Blinds and shades can be easily motorized with remote control using our retrofit motors inserted into roller tubing. We sell all across the USA, including South Carolina: Columbia, Charleston, North Charleston, Rock Hill, Mount Pleasant, Greenville, Summerville, Sumter, Spartanburg, Hilton Head Island, Goose Creek, Florence, Aiken, Anderson, Myrtle Beach. Description: Blinds and shades can be easily motorized with remote control using our retrofit motors inserted into roller tubing. We sell all across the USA, including Tennessee: Memphis, Nashville, Knoxville, Chattanooga, Clarksville, Murfreesboro, Jackson, Johnson City, Franklin, Hendersonville, Kingsport, Bartlett, Collierville, Cleveland, Germantown. Description: Blinds and shades can be easily motorized with remote control using our retrofit motors inserted into roller tubing. We sell all across the USA, including Virginia: Virginia Beach, Norfolk, Chesapeake, Richmond, Arlington, Newport News, Hampton, Alexandria, Portsmouth, Roanoke, Suffolk, Lynchburg, Centreville, Dale City, Reston, etc. With our motorized dual shade system, you can switch between translucent UV protection and blackout blinds. Description: Blinds and shades can be easily motorized with remote control using our retrofit motors inserted into roller tubing. We sell all across the USA, including West Virginia: Charleston, Huntington, Parkersburg, Wheeling, Morgantown, Weirton, Fairmont, Beckley, Clarksburg, Martinsburg, South Charleston, Saint Albans, Bluefield, Vienna, Cross Lanes. Description: Blinds and shades can be easily motorized with remote control using our retrofit motors inserted into roller tubing. We sell all across the USA, including Wisconsin: Milwaukee, Madison, Green Bay, Kenosha, Racine, Appleton, Waukesha, Oshkosh, Eau Claire, Janesville, West Allis, La Crosse, Sheboygan, Wauwatosa, Fond du Lac. Description: Our phone app for motorized blinds and shades can be used to configure event triggering for our temperature and light sensing environmental sensor. Our wifi phone app can also be used with RF and IR remotes for skylight and window opener motors, projector screens, smart film, motorized drapes, lighting, etc. Description: DC tubular motors used for roller blinds and home theater projector screens. With battery backup, and DC tubular motors used for roller blinds and home theater projector screens. With battery backup, and solar power, Rollertrol motors can be controlled individually in a group by a single remote. Description: Motorized blinds and room lighting can both be controlled by the same remote with our RollerTrol combo package. Sun shades can also be installed with a dual roller system so that you can select different shade material, depending on light conditions and time of day. For example, you could switch between translucent and blackout blinds. Description: An auto-off digital multimeter with audible beeps for testing and detecting short circuits is a very useful piece of test equipment for use with our remote control Rollertrol™ window shade and blind motors, skylight openers and other electric devices such as our Arduino breakout boards. You never have to worry about a dead battery on this value priced DMM and your eyes can stay focussed on your printed circuit board or other device when testing for shorts or continuity because the unit beeps when the meter probes contact two points that are connected. Description: Install a motorized display case system to add motion to display cabinets and attract shoppers to your merchandise. Increase your retail product sales with motors and actuators to raise, lower and move your products - create an eye catching product display with remote control and programmable systems that will boost sales. Description: The DIY network channel and other DIY oriented businesses are very popular these days. As we emerge from a worldwide financial crisis, people everywhere are looking to save money, and our do-it-yourself motorized blind and shade projects are a great way to accomplish that. Description: DIY: buy a motorized remote control skylight opener (actuator) for ventilation control and skylight or window opening - use RollerTrol™ 12v DC skylight opener with our remote control systems. Description: DIY: buy a motorized remote control window opener (actuator) for ventilation control and window or skylight opening - use RollerTrol™ 12v DC window opener with our remote control systems. Description: Google Assistant can control motorized blinds and shades with the Google Home system. It can also be used with Raspberry Pi to control TV, projector screens, window openers, drapes, lighting, skylight openers, and many other devices. There are a number of different ways to do this. Description: x10 Home automation: how to make an x10 control interface for our RollerTrol™ motorized DIY window blinds and shades. Use 12v DC tubular motors to raise and lower your blinds controlled by your home automation system. Description: Motorized roller shades often need a slight adjustment to make the fabric roll up and roll down perfectly. This is easily qaccomplished using a post-it note or other small piece of thin paper set in just the right place. This video shows how to do it. Description: Our DIY blind motors motors run on 12 volts DC and can be used to retrofit existing blinds. 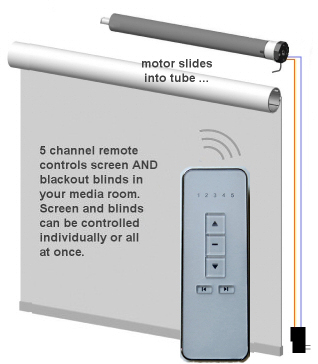 Motorized roller blinds and shades use our multi-channel remotes to control motors for your room blinds. Use wifi on your tablet, phone or PC too. Description: Blind motors can be used to retrofit and motorize Roman shades. Our control systems can then be used to control the Roman shades, just like conventional shades and window openers. You can even use voice control such as the Alexa system, with the amazing Node-RED visual design program for IoT. Description: Motorized roller blinds and shades: our DIY blind motors motors run on 12 volts DC and can be used to retrofit existing blinds. Use our multi-channel remotes to control motor your existing room blinds and control each one individually. Use wifi on your tablet, phone or PC too. Description: motorized shade and blind motors (DIY) are our specialty: electric tubular motors are used for remote control of window blinds and shades, skylight and window openers. Description: How to use RollerTrol™ 12v DC controllers. Typical applications are blinds and shades, mini blinds, and home theater projector screens. With battery backup, and solar power, Rollertrol™ motors can be controlled individually in a group by a single remote. Description: How to use RollerTrol™ 12v DC tubular motors (non-radio type). Typical applications are blinds and shades, mini blinds, and home theater projector screens. With battery backup, and solar power, Rollertrol™ motors can be controlled individually in a group by a single remote. Description: How to use RollerTrol™ 12v DC motors with our G series Maxi radio motor. Typical applications are extra heavy blinds and shades and home theater projector screens. With optional solar power, Rollertrol™ G series radio motors can be controlled individually or in a group by a single multi-channel remote. Description: How to use RollerTrol™ 12v DC tubular motors (G series - built in radio controlled type). Typical applications are blinds and shades, mini blinds, and home theater projector screens. With battery backup, and solar power, Rollertrol™ G series motors can be controlled individually or in a group by a single remote. Description: How to use RollerTrol™ radio controlled battery motors (built in battery type). With battery backup, and solar power, Rollertrol™ roleer blind motors can be controlled individually or in a group by a single remote. Extend your reach with our Vera home automation systems; control blinds and shades with web enabled devices like phones, tablets, and PC when at home or away. Description: Remote control of relays, solenoids and motors. ON/OFF switching by RF remote control: how to set up our RollerNode™ controller for switching devices on and off by remote control. Description: How to use RollerTrol™ 12v DC tubular motors (built in radio controlled type). Typical applications are blinds and shades, mini blinds, and home theater projector screens. With battery backup, and solar power, Rollertrol™ motors can be controlled individually in a group by a single remote. Description: How to use RollerTrol™ 12v motorized ball valves with wired wall switch. Typical applications are greenhouse and garden irrigation systems and water fountains. You can also add home automation to this unit at a later time via an on-board header that accepts dry contact relay closure. Description: How to use RollerTrol™ G series 12v DC blind motors. Typical applications are very large blinds and shades, golf impact screens, and home theater projector screens. Description: How to use RollerTrol™ 12v DC motors with our G series stand-alone 15 amp radio receiver/controller. Typical applications are window openers, skylight openers, blinds and shades, mini blinds, and home theater projector screens. With optional battery backup, and solar power, Rollertrol™ G series motors can be controlled individually or in a group by a single multi-channel remote. Description: How to use RollerTrol™ 12v DC motors with our G series stand-alone 15 amp radio receiver. Typical applications are blinds and shades, window openers, skylight openers, mini blinds, and home theater projector screens. With optional battery backup, and solar power, Rollertrol™ G series motors can be controlled individually or in a group by a single multi-channel remote. Description: How to use RollerTrol™ 12v DC motors with our G series stand-alone radio receiver. Typical applications are blinds and shades, window openers, skylight openers, mini blinds, and home theater projector screens. With optional battery backup, and solar power, Rollertrol™ G series motors can be controlled individually or in a group by a single multi-channel remote. Description: How to use RollerTrol™ 12v DC ultra-low standby tubular motors (built in radio controlled type). Typical applications are blinds and shades, mini blinds, and home theater projector screens. With battery backup, and solar power, Rollertrol™ motors can be controlled individually in a group by a single remote. Description: DIY: how to set up our motorized remote control window opener (actuator) for ventilation control, window or skylight opening, shutters - use RollerTrol™ 12v DC linear chain actuator with our remote control systems. Description: How to use RollerTrol™ 12v window/skylight/vent openers with wired wall switch. Typical applications are window openers, skylight openers, and anything else you would like to move. You can also add home automation to this unit at a later time via an on-board header that accepts dry contact relay closure. Description: How to use RollerTrol™ 12v DC G series radio controlled tubular motors. Typical applications are blinds and shades, mini blinds, and home theater projector screens. Rollertrol™ G series motors can be controlled in a group or individually by a single multi-channel remote. Description: Motors and sensors designed for IoT (Internet of Things) usage - Arduino® compatible 12v programmable remote control system for shade and blind motors, skylights, window openers, LED lighting, etc. Our RollerNode™, GrowerNode™ and BoaterNode™ radio RF remote control system is designed for residential and commercial applications. Automate blinds, shades, motors, window and skylight openers, lighting or anything else you need to control. Use your web enabled phone, tablet or PC to control your environment while you are home or away. Description: A latching relay can used (when triggered by an impulse) as a power switch to operate a circuit. Our solid state (ssr) version of a single pole relay is toggled on/off by a 12 volt momentary pulse (positive or negative). A momentary contact activates it, and it can stay latched until it receives another 12v pulse. Description: Garden or lawn irrigation and watering: how to make an affordable automatic irrigation timer system with our RollerTrol™ solenoid valve control system. Use 12v solenoid valves with your x10 or other home automation system to turn sprinkler, soaker hose, and indoor drip system on and off by timer or sensor. Title: What Is Visual Light Communications (VLC) LED Data? Description: Visual Light Communications (VLC) is a technology that uses LED room lighting to distribute data in the home or office that might otherwise be transmitted by alternative wireless methods, such as WiFi. Description: Choose a light sensing photocell switch for lighting, motors, actuators, solar systems, marine (anchor light) and other applications with this handy comparison table of specifications. Compare features to suit your particular requirements. Description: Light sensors can be used to operate our motorized window blinds and shades. This series of articles provides a step by step guide to programming the radio remote control light sensor photocell switch used with our tubular motors. The light sensor is battery operated and requires no wiring; you can mount it on a window with a suction cup in any convenient location. Description: Light sensors are available for our motorized window blinds and shades. The light sensor is powered by battery and requires no wiring; you can mount it on a window in any convenient location. This series of articles is a guide to programming the radio remote control light sensor used with our tubular motors. Description: Our motorized window blinds and shades can be activated by a light sensing module. This series of articles is a step by step guide to programming the wireless radio remote control light sensor used with our tubular motors. The light sensor is requires no wiring and can be wall mounted in any convenient location. Description: A radio remote control light sensor used with our window blind and shade motors. This series of articles provides a step by step guide to programming the battery operated wireless light sensor. You can mount it on a wall in any convenient location. Description: Motorized roller blinds and shades: our Maxi series of DIY blind motors for very large shades run on 12 volts DC and can be used to retrofit existing blinds. Use our multi-channel remotes to control motors for your existing room blinds and control each one individually. Use wifi on your tablet, phone or PC too. Description: Micropython DC blind motor reversing software switch for the ESP32 platform. Blinds, shades and electric window openers can be operated with this. Description: Add a motor to blinds and shades: you can motorize existing roller tubes (DIY) and retrofit them to a multi-channel remote control shade system. It also works with double rollers so you can use your multi-channel remote to control which shade material is used - tinted solar film, translucent, blackout, etc. Description: DIY: replace a manually operated skylight opener with a motorized remote control skylight opener (actuator); hear how on of our customers retrofitted and converted a Velux manual skylight opener. Description: Blinds and shades can be motorized with our retrofit motors inserted into roller tubing. We sell all across Canada, including Ontario: Toronto, Ottawa, Mississauga, Brampton, Hamilton, London, Markham	,Vaughan, Kitchener, Windsor, etc. With our dual shade system, you could switch between translucent UV protection and blackout blinds. Description: Our remote control system uses digital radio technology to automate your entire home - window blinds, shades, skylights, lighting, and irrigation systems. Description: Blinds and shades can be motorized with our retrofit motors inserted into roller tubing. We sell window treatment motors all across Canada, including Alberta: Edmonton, Calgary, Banff, Brooks, Lethbridge, Okotoks, Camrose, Lloydminster, Red Deer, Canmore, Lloydminster, Wetaskiwin, Cold Lake, Wood Buffalo, Grande Prairie, Medicine Hat, etc. With our dual shade system, you could switch between translucent UV protection and blackout blinds. Description: Blinds and shades can be motorized with our retrofit motors inserted into roller tubing. We sell window treatment motors all across Canada, including Manitoba: Winnipeg, Brandon, Thompson, Selkirk, Steinbach, Dauphin, Winkler, Morden, The Pas, Flin Flon, Swan River, Stonewall, Altona, Virden, Neepawa, etc. With our dual shade system, you could switch between translucent UV protection and blackout blinds. Description: Blinds and shades can be motorized with our retrofit motors inserted into roller tubing. We sell window treatment motors all across Canada, including New Brunswick: Saint John, Moncton, Fredericton, Bathurst, Edmundston, Campbellton, Oromocto, Grand Falls, Woodstock, Shediac, Caraquet, Saint Stephen, Dalhousie, Sussex, Sackville, etc. With our dual shade system, you could switch between translucent UV protection and blackout blinds. Description: Blinds and shades can be motorized with our retrofit motors inserted into roller tubing. We sell window treatment motors all across Canada, including Saskatchewan: Regina, Saskatoon, Estevan, Moose Jaw, North Battleford, Prince Albert, Swift Current, Weyburn, Yorkton, etc. With our dual shade system, you could switch between translucent UV protection and blackout blinds. Description: Blinds and shades can be motorized with our retrofit motors inserted into roller tubing. We sell window treatment motors all across Canada, including BC: Vancouver, Victoria, Nanaimo, Surrey, Kamloops, Kelowna, Vernon, Penticton, Oliver, Okanagan Falls, Prince George, etc. With our dual shade system, you could switch between translucent UV protection and blackout blinds. Description: Blinds and shades can be motorized with our retrofit motors inserted into roller tubing. We sell window treatment motors all across the USA, including Arizona: Phoenix, Tucson, Mesa, Chandler, Glendale, Scottsdale, Gilbert, Tempe, Peoria, Surprise, Goodyear, Lake Havasu, Sedona, Flagstaff, etc. With our motorized dual shade system, you can switch between translucent UV protection and blackout blinds. Description: Blinds and shades can be motorized with our retrofit motors inserted into roller tubing. We sell window treatment motors all across Australia, including Sydney, Melbourne, Brisbane, Perth, Adelaide, Gold Coast-Tweed, Newcastle, Canberra-Queanbeyan, Canberra, Wollongong, Sunshine Coast, Greater Hobart, Geelong, Townsville, Cairns, and Darwin. With our motorized dual shade system, you can switch between translucent UV protection and blackout blinds. Description: Blinds and shades can be motorized with our retrofit motors inserted into roller tubing. We sell window treatment motors all across the USA, including California: Los Angeles, San Diego, San Jose, San Francisco, Long Beach, Sacramento, Fresno, Oakland, Santa Ana, Anaheim, Riverside, Bakersfield, Stockton, Modesto, Chula Vista, etc. With our motorized dual shade system, you can switch between translucent UV protection and blackout blinds. Description: Blinds and shades can be motorized with our retrofit motors inserted into roller tubing. We sell window treatment motors all across the USA, including Florida: Jacksonville, Miami, Tampa, Saint Petersburg, Hialeah, Orlando, Fort Lauderdale, Pembroke Pines, Tallahassee, Hollywood, Coral Springs, Cape Coral, Gainesville, Port Saint Lucie, Miramar, etc. With our motorized dual shade system, you can switch between translucent UV protection and blackout blinds. Description: Blinds and shades can be motorized with our retrofit motors inserted into roller tubing. We sell window treatment motors all across the USA, including Georgia: Atlanta, Augusta, Columbus, Savannah, Athens, Sandy Springs, Macon, Roswell, Albany, Johns Creek, Warner Robins, Alpharetta, Marietta, Valdosta, Smyrna, Dunwoody, North Atlanta, Mableton, Rome, Martinez, Peachtree City, Gainesville, etc. With our motorized dual shade system, you can switch between translucent UV protection and blackout blinds. Description: Blinds and shades can be motorized with our retrofit motors inserted into roller tubing. We sell window treatment motors all across the USA, including Massachusetts: Boston, South Boston, Worcester, Springfield, Lowell, Cambridge, New Bedford, Brockton, Quincy, Lynn, etc. With our motorized dual shade system, you can switch between translucent UV protection and blackout blinds. Description: Blinds and shades can be motorized with our retrofit motors inserted into roller tubing. We sell window treatment motors all across the USA, including Nevada: Las Vegas, Paradise, Reno, Henderson, Sunrise Manor, Spring Valley, North Las Vegas, Sparks, Carson City, Winchester, Pahrump, Sun Valley, Whitney, Elko, Boulder City, Enterprise, Gardnerville Ranchos, Spring Creek, Incline Village-Crystal Bay, Mesquite, Spanish Springs, Nellis AFB, Fernley, Fallon, Winnemucca, Laughlin, etc. With our motorized dual shade system, you can switch between translucent UV protection and blackout blinds. Description: Blinds and shades can be motorized with our retrofit motors inserted into roller tubing. We sell window treatment motors all across the USA, including New Jersey: Newark, Jersey City, Paterson, Elizabeth, Edison, Toms River, Trenton, Clifton, Camden, Brick Township, etc. With our motorized dual shade system, you can switch between translucent UV protection and blackout blinds. Description: Blinds and shades can be motorized with our retrofit motors inserted into roller tubing. We sell window treatment motors all across the USA, including New Mexico: Albuquerque, Las Cruces, Rio Rancho, Santa Fe, Roswell, Farmington, South Valley, Clovis, Hobbs, Alamogordo, Carlsbad, Gallup, Deming, Los Lunas, Chaparral, Sunland Park, Las Vegas, etc. With our motorized dual shade system, you can switch between translucent UV protection and blackout blinds. Description: Blinds and shades can be motorized with our retrofit motors inserted into roller tubing. We sell window treatment motors all across the USA, including New York: Albany, Binghamton, Buffalo, Elmira, Ithaca, Kingston, Irondequoit, Mechanicville, New York City, Oneonta, Poughkeepsie, Rochester, Saratoga Springs, Schenectady, Syracuse, Troy, Watertown, Watervliet, West Seneca, Utica, Yonkers, etc. With our motorized dual shade system, you can switch between translucent UV protection and blackout blinds. Description: Blinds and shades can be motorized with our retrofit motors inserted into roller tubing. We sell window treatment motors all across New Zealand, including Auckland, Wellington, Christchurch, Hamilton, Napier-Hastings, Tauranga, Dunedin, Palmerston North, Nelson, Rotorua, New Plymouth, Whangarei, Invercargill, Whanganui (Wanganui), and Gisborne. With our motorized dual shade system, you can switch between translucent UV protection and blackout blinds. Description: Blinds and shades can be motorized with our retrofit motors inserted into roller tubing. We sell window treatment motors all across the USA, including Oregon: Portland, Eugene, Salem, Gresham, Beaverton, Hillsboro, Medford, Bend, Springfield, Corvallis, Tigard, Albany, Lake Oswego, Keizer, McMinnville, Oregon City, Grank Pass, Tualatin, West Linn, Milwaukie, Woodburn, etc. With our motorized dual shade system, you can switch between translucent UV protection and blackout blinds. Description: Blinds and shades can be motorized with our retrofit motors inserted into roller tubing. We sell window treatment motors all across Canada, including Quebec: Montreal, Quebec City, Hull, Laval, Gatineau, Longueuil, Sherbrooke, Saguenay, Levis, Trois-Rivieres, Terrebonne, etc. With our motorized dual shade system, you can switch between translucent UV protection and blackout blinds. Description: Blinds, shades, drapes, curtains and window openers can be motorized with our retrofit motors inserted into roller tubing. We sell window treatment motors all across Canada, including Saskatchewan: Regina, Saskatoon, Estevan, Moose Jaw, North Battleford, Prince Albert, Swift Current, Weyburn, Yorkton, etc. With our dual shade system, you could switch between translucent UV protection and blackout blinds. Description: Blinds and shades can be motorized with our retrofit motors inserted into roller tubing. We sell window treatment motors all across the USA, including Texas: Dallas, Fort Worth, Houston, Abilene, Addison, Allen, Amarillo, Arlington, Austin, Beaumont, Brownsville, Bryan, College Station, Del Rio, Galveston, Garland, Grand Prairie, Grapevine, Killeen, Kingsville, Laredo, Longview, Lubbock, Marshall, McAllen, Mesquite, Midland, Nacogdoches, Odessa, Plano, San Angelo, San Antonio, San Marcos, South Padre Island, Texarkana, Tyler, Victoria, Waco, Waxahachie, Weatherford, Wichita Falls, etc. With our motorized dual shade system, you can switch between translucent UV protection and blackout blinds. Description: Blinds and shades can be motorized with our retrofit motors inserted into roller tubing. We sell window treatment motors all across the USA, including Washington DC and Washington State: Seattle, Spokane, Tacoma, Vancouver, Bellevue, Everett, Federal Way, Kent, Yakima, Bellingham, Lakewood, Kennewick, Shoreline, Renton, Redmond, Kirkland, Olympia, etc. With our motorized dual shade system, you can switch between translucent UV protection and blackout blinds. Description: Make a motorized dual window shade system with double rollers: how to use RollerTrol™ 12v DC tubular motors to make a motorized shade system with two rollers. Use your multi-channel remote to control which shade material is used - tinted solar film, translucent, blackout, etc. Description: Skylight motor system uses 12v DC tubular motors (battery, solar charger optional) to make motorized retractable skylight shades or bottom-up window shades (we have skylight openers too). Z-Wave control is also available. Typical applications are skylight shades, bottom up window shades, RV motorhomes and travel trailers. Description: How to make a motorized retractable skylight shade with RollerTrol™ 12v DC tubular motors. Some questions and answers for this DIY motorized skylight blind project. Description: How to use RollerTrol™ 12v DC tubular motors to make motorized retractable window shades. Typical applications are window blinds and shades, mini blinds, and home theater projector screens. Description: Projector screen motors for home theater use: you can make a remote control projector screen for home theater with a roller blind motor, an aluminum or steel tube, and some screen material. Description: DC tubular motors used for roller blinds and home theater projector screens. With battery backup, and solar power, Rollertrol motors can be controlled individually in a group by a single remote. Description: Night shades can be motorized with retrofitted motors inserted into the roller tubing. You can also replace the roller tubing with a larger size. Night shades can also be installed with a dual roller system so that you can select different shade material, depending on light conditions and time of day. For example, you could switch between translucent and smoked see-through shades. Description: Our Raspberry Pi (RPi) kits can control blind and shade motors and many other devices. The kit makes a great low cost, easy to use home automation and greenhouse controller hub when coupled with the OpenNetHome system from Stefan Stromberg. Description: The Raspberry Pi (RPi) can control blind motors and many other devices. It makes a great low cost, easy to use home automation and greenhouse controller hub when coupled with open source home automation software like the brilliant OpenNetHome system from Stefan Stromberg. Description: The Raspberry Pi (RPi) can control our shade motors, window openers and many other devices. It makes a great low cost, user friendly home automation and greenhouse controller hub when used with the OpenNetHome system. Description: The Raspberry Pi makes a great low cost, user friendly home automation and greenhouse controller hub. It can control our shade motors, window openers and many other devices when used with the OpenNetHome system. Description: The Raspberry Pi can control our shade/blind motors, skylight/window openers and many other devices. It makes a great low cost, user friendly home automation and greenhouse controller hub when used with the OpenNetHome system. Description: Motorized blinds and shades can be controlled by the Raspberry Pi operating as a home automation hub. You can also control skylight/window openers and many other devices. It makes a great user friendly, affordable home automation and greenhouse controller hub when used with the OpenNetHome system. Description: Blind motors can be controlled by the Raspberry Pi (RPi) when used with Home Assistant and the BroadLink RF-IR blaster as a home automation system. The Raspberry Pi makes a great low cost, easy to use home automation and greenhouse controller hub when coupled with open source home automation software like the amazing Home Assistant software. Description: Shade motors can be controlled by the Raspberry Pi (RPi) when used with the BroadLink RF-IR blaster and Home Assistant software. The Raspberry Pi makes a great low cost, easy to use home automation hub when coupled with Home Assistant software. Description: Our blind and shade motors can be operated by the Raspberry Pi (RPi) using the BroadLink RF-IR blaster and Home Assistant software. The Raspberry Pi makes a great low cost, easy to use home automation hub; see how we implemented a multi-position slider control with the Home Assistant software. Description: RollerNode™ is a multi-channel remote control receiver (using an open source Arduino® compatible microprocessor) that can control blind and shade motors as well as low voltage LED lights such as strip lighting, swivel base floodlights, ceiling pot lamps, etc. Description: Remote control Rollertrol™ window shade and blind motors can be operated with stand alone web server hubs such as Vera™ and Veralite™ home automation systems via the RFXCOM™ Z-wave interface RF dongle. Vera and Veralite are very flexible home automation controllers that run as a web server on your local lan and wifi network. Operate blinds and other devices with any web enabled device via the browser (smartphones, tablets, laptops, desktops) and any operating system (Windows, Apple, Linux, etc). Also compatible with HomeSeer™ with the RFXCOM™ plug-in. Description: RollerTrol Reviews have increased over the years, and here we have listed a few of the many complimentary comments we have received. Also, please see examples of our return policy limits. Description: DIY shade and blind motors: 12v DC electric tubular motors are used for remote control of window blinds and shades, mini blinds, skylights and home theater projector screens. How to make your own motorized window blinds. Description: How to use RollerTrol™ 12v DC tubular motors to make motorized retractable skylight shades (we have skylight openers too). Typical applications are skylight blinds and shades, mini blinds, and home theater projector screens. Description: Skylight shade motor kit instructions. This unit uses 12v DC tubular motors (battery, solar charger optional) to make motorized retractable skylight shades (we have skylight openers too). Typical applications are skylight blinds, greenhouse shades, bottom up shades and blinds, pergolas. Description: Skylight shade motor component instructions. This unit uses 12v DC tubular motors (battery, solar charger optional) to make motorized retractable skylight shades (we have skylight openers too). Typical applications are skylight blinds, greenhouse shades, bottom up shades and blinds, pergolas. Description: Skylight motor system uses 12v DC tubular motors (battery, solar charger optional) to make motorized retractable skylight shades (we have skylight openers too). Typical applications are skylight shades, greenhouse shades, bottom up shades, pergolas. Description: smart film window glass (PDLC) with wifi remote control electric transparency is perfect for window and glass privacy treatment at home and in the office. Our Arduino compatible RollerNode 12v DC control systems control simple glass stick-on application of film cut to any size providing instant transparency control by wifi or other electronic switch control systems. Instantly retrofit any glass surface. Description: smart film starter kit for window glass (PDLC) with wifi remote control of electric transparency is perfect for window and glass partition privacy at home and in the office. Our RollerNode 12v DC control systems control stick-on application of film cut to any size providing instant transparency control by wifi or other electronic switch control systems. Quickly convert any glass surface. Description: Smart home x10 starter kits are complete home automation systems for motorized blinds and shades. The remote control system uses PC software to automate your entire home - window blinds, shades, skylights, 12v LED and regular lighting, irrigation and watering control systems - program your own smart home. Description: SmartThings guide: how to connect our blind and motorized shade systems to the Smart Things home automation controller system (ST). Shade and blind motors (DIY) are our specialty: 12v DC electric tubular motors are used for remote control of window treatment blinds and shades, window openers, skylight openers, drapes and other devices. Description: Solar shades can be motorized with one of our retrofit motors inserted into the roller tubing. You can also cut the shade material off and replace the roller tubing with a larger size. Solar shades can be installed with a double roller system for selecting different shade material. For example, you could switch between blackout and translucent blinds. Description: DC tubular motors used for blackout roller blinds and home theater projector screens. Subscribe here and learn how to build a home theater system and get the room back when it is not in use. Description: Sun shades can be motorized with one of our retrofit motors inserted into the roller tubing. You can also cut the shade material off and replace the roller tubing with a larger size. Sun shades can also be installed with a dual roller system so that you can select different shade material, depending on light conditions and time of day. For example, you could switch between translucent and blackout blinds. Description: Motorized blinds and shades can be triggered to operate with our temperature and light sensing sytem. Our wifi phone app can also be used with RF and IR remotes for skylight and window opener motors, projector screens, smart film, motorized drapes, lighting, etc. Description: Motorized shades can be operated by our temperature and light sensing devices. Our wifi hub phone app can also be used with RF and IR remotes for skylight and window opener motors, projector screens, smart film, motorized drapes, lighting, etc. Description: Our motorized blinds and shades can be controlled by our temperature and light sensing environmental sensor. Our user-friendly wifi phone app can also be used with RF and IR remotes for skylights with rain sensing, motorized drapes, window opener motors, projector screens, lighting, smart film, etc. Description: Choose motors for blinds, shades and other applications with this handy comparison table of specifications. Compare size and load capabilities to suit your particular requirements. Tubular motors used for window blinds and shades, mini blinds, skylights and home theater projector screens. Rollertrol™ motors can be controlled individually in a group by a single remote. Description: Home automation: how to use our RollerTrol™ Universal Interface for motorized DIY window blinds and shades. Use 12v DC tubular motors to raise and lower your blinds controlled by your home automation system. Description: how to replace Velux™ motorized skylight opener (actuator) - use RollerTrol™ 12v DC linear actuator with our remote control systems. Description: Vera and Veralite are powerful, flexible home automation controllers that are compatible with our window blind and shade motors, LED lighting controllers, and other devices like our window openers. Vera is actually a self-contained web server that operates as your local lan and wifi network. Any web enabled device can be used to operate the system via the browser (smartphones, tablets, laptops, desktops) and any operating system (Windows®, Apple®, Linux®, B2G, Android®, Tizen®, IOS®, etc). They can also control various different device protocols, such as Z-Wave®, Insteon®, and x10®. Description: Part 2 of the Instructions for using Vera and VeraLite with RollerTrol blind and shade motors. Veralite is a very flexible home automation controller that runs as a web server on your local lan and wifi network. The blind and shade motors can be operated by any web enabled device via the browser (smartphones, tablets, laptops, desktops) and any operating system. Vera can also control various different device protocols, such as Z-Wave®, Insteon®, and x10®. Description: Instructions for using Vera and VeraLite with RollerTrol blind and shade motors. Veralite is a powerful and very flexible home automation controller that runs as a web server on your local lan and wifi network. The blind and shade motors can be operated by any web enabled device via the browser (smartphones, tablets, laptops, desktops) and any operating system (Windows®, Apple®, Linux®, B2G, Android®, Tizen®, IOS®, etc). Vera can also control various different device protocols, such as Z-Wave®, Insteon®, and x10®. Description: How to use RollerTrol™ 12v DC tubular motors (G series - built in radio controlled type) with our remote control wall switches. Typical applications are blinds and shades, mini blinds, and home theater projector screens. With battery backup, and solar power, Rollertrol™ G series motors can be controlled individually or in a group by a single wall mounted remote. Description: Our wall mount switches use radio RF control signals to operate our motorized window blinds and shade motors, and require no wiring. This article provides a step by step guide to programming the radio remote control wall switches used with our tubular motors. The switches are battery operated and last for years on a single button battery; you can mount them on a wall in any convenient location. Description: LED is short for Light Emitting Diode, a solid state electronic device that emits light when an electrical current passes through it. LED lighting (especially 'warm white') is rapidly replacing conventional lighting methods because of advances in technology that result in low energy consumption, high brightness, low heat conversion, warm color, low lifetime cost, flexible shapes, and a compact form factor. Description: What is X10? Home automation remote control systems with PC software automate your entire home - motorized blinds and shades, 12v LED and regular lighting, irrigation and watering control systems - program your own smart home. Description: Why use LED lights? LED lights have many benefits; this article is about LED advantages. A LED is a solid state device that emits light when a DC voltage is applied. Warm white LED lighting is rapidly replacing conventional lighting methods because of low energy consumption, high brightness, low heat conversion, warm color, low lifetime cost, and a compact form factor. Description: WiFi can be used to detect switch closure, operate relays, monitor temperature probes, and switch fans, lights, irrigation valves and many other devices with an Android app. This article is a guide to selecting an available IP address on your router for our WiFi relay controller and temperature probe. Description: WiFi can be used to monitor temperature probes, detect switch closure, and operate fans, lights, irrigation valves and many other devices with an Android app. This series of articles is a step by step guide to the operation of our WiFi relay controller and temperature probe. Description: Any AC powered device can be turned on and off with our AC smart switch outlet that uses WiFi and a phone app for activation. This smart plug also has timers, a switchable night light, and it can also be controlled from the e-Air sensor for IFTTT applications. Description: WiFi used with Android monitors temperature probes, detects switch closure, operates relays, and switches fans, lights, irrigation valves and many other devices. This article is a guide to making the connections for our WiFi relay controller and temperature probe. Description: WiFi can be used with Android to monitor temperature probes, detect switch closure, operate relays, and switch fans, lights, irrigation valves and many other devices. This article is a guide to setting the fixed IP address operation of our WiFi relay controller and temperature probe. Description: 'smart glass' window film (PDLC) with wifi remote control electric transparency is creating a revolution in the window treatment industry for home and office. Fully compatible with our RollerNode 12v DC control systems, a simple glass stick-on application of film cut to any size provides instant transparency control by wifi or other electronic switch control systems. You can instantly retrofit any glass surface. Description: Churches, Synagogues, Cathedrals and Temples often need motorized blind and shade systems with remote control. Windows in these buildings are often very tall and require motors like ours that allow for unlimited blind and shade lengths, suitable for any of the following: abbey, chapel, Mosque, sanctuary, shrine, tabernacle, temple. Description: restaurants, coffee shops, cafes, diners and other eateries often need motorized blind and shade systems with remote control. Windows in these buildings are often very tall and require motors like ours that allow for unlimited blind and shade lengths. Description: x10 irrigation control is just one of the many systems you can automate in your home with our software kits. Use it to control watering of lawns, gardens, greenhouses, indoor plant drip systems and any other water distribution system you need. Pick the best time of the day to water your plants using our software timer modules. Description: The x10 starter kits we sell are complete home automation remote control systems with PC software to automate your entire home - motorized blinds and shades, 12v LED and regular lighting, irrigation and watering control systems - program your own smart home. Description: Z-WAVE can be used to operate our motorized blinds, shades, window and skylight openers, and drapery systems. This series of articles provides a step by step guide to the operation of our Z-WAVE relay controller used with our tubular motors and window actuators. You can also use this 12v Z-WAVE relay controller to trigger the operation of fan motors, lights and many other electrical devices. Use with any Z-WAVE hub, such as Wink, SmartThings, Razberry Pi, Vera, Homeseer, Syslink, Zipr, Xuan, Staples Connect, Fibaro, Xuan, Homelive, Isis, Nexia, etc. Description: zwave relay interfaces for blinds, shades, drapes, curtains and window openers are easily operated with Z-WAVE or any type of relay module. This article is about using relay modules to trigger the digital radio control of our automated tubular motors, skylight and window openers, and other 12v DC devices. Use with any Z-WAVE hub, such as Fibaro, Xuan, Homelive, Vera, Homeseer, Syslink, Zipr, Xuan, Razberry Pi, Wink, SmartThings, Staples Connect, Isis, Nexia, etc. Description: ZWAVE motorized blinds, shades, drapes, curtains and window openers are easily automated with Vera. This article series is a guide to the operation of our ZWAVE relay latching module used to operate our blind motors and window actuators. This ZWAVE relay controller can also activate irrigation valves, fans, lights and any other electrical device you want to automate. Use with any Z-WAVE hub, such as SmartThings, Wink, Fibaro, Xuan, Homelive, Homeseer, Syslink, Zipr, Xuan, Razberry Pi, Staples Connect, Isis, Nexia, etc. Description: zwave relay interfaces for blinds, shades, drapes, curtains and window openers are easily operated with ZWAVE or any type of relay module. This article is about using relay modules to trigger the digital radio control of our automated tubular motors, skylight and window openers, and other 12v DC devices. Use with any Z-WAVE hub, such as Fibaro, Xuan, Homelive, Vera, Homeseer, Syslink, Zipr, Xuan, Razberry Pi, Wink, SmartThings, Staples Connect, Isis, Nexia, etc. Description: Z-Wave contact closure detection, for doors and windows, with magnetic switch. Use this to send a trigger signal to your Z-Wave hub, either by magnetic switch position or contact closure on a separate circuit (both can be used simultaneously). Description: ZWAVE motorized blinds, shades, drapes, curtains and window openers are easily automated. This article series is designed as a guide to the operation of our ZWAVE relay latching module used to trigger the operation of our automated tubular motors and window actuators. This ZWAVE relay controller can also activate fans, lights, irrigation valves and any other electrical device you want to automate. Use with any Z-WAVE hub, such as Fibaro, Xuan, Homelive, Vera, Homeseer, Syslink, Zipr, Xuan, Razberry Pi, Wink, SmartThings, Staples Connect, Isis, Nexia, etc. Description: ZWAVE can be used to operate our motorized window and skylight openers, blinds, shades, and drapery systems. This series of articles provides a step by step guide to the operation of our ZWAVE relay controller used with our tubular motors and window actuators. You can also use this 12v ZWAVE relay controller to trigger the operation of fan motors, lights and many other electrical devices. Use with any Z-WAVE hub, such as Wink, SmartThings, Vera, Homeseer, Syslink, Zipr, Xuan, Razberry Pi, Staples Connect, Fibaro, Xuan, Homelive, Isis, Nexia, etc. Description: Use ZWAVE to operate our motorized window and skylight openers, blinds, shades, and drapery systems. This article series provides a step by step guide to the operation of our ZWAVE relay controller used with our tubular motors and window actuators. This 12v ZWAVE relay controller can also trigger lights, fan motors, irrigation valves and many other electrical devices. Use with any Z-WAVE hub, such as Vera, Homeseer, Syslink, Zipr, Xuan, Razberry Pi, Wink, SmartThings, Staples Connect, Fibaro, Xuan, Homelive, Isis, Nexia, etc. Description: ZWAVE Window Opener: how to set up a motorized remote control window opener (actuator) for ventilation control, window or skylight opening, shutters - use RollerTrol™ 12v DC chain actuator with our Z-WAVE remote control systems.